More than 50 years ago, Dr. Archibald Ford, Commissioner of the Arkansas Department of Education, had a vision: K-12 economic literacy would benefit individual lives and the state. With Dr. Bessie B. Moore, he founded the Arkansas State Council on Economic Education, which is Economics Arkansas today. 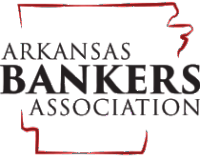 His son Joe Ford and grandson Scott Ford have made significant contributions to Arkansas's economy by embracing economic and free market principles. Little Rock Marriott, 3 Statehouse Plaza. 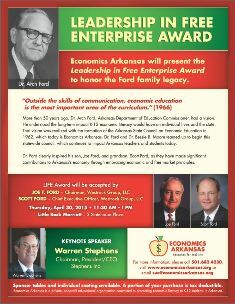 Warren Stephens of Stephens Inc. will deliver the keynote address. Click here to download the flyer. Feel free to distribute and share. Click here to download the order form to sponsor tables or purchase individual seating.